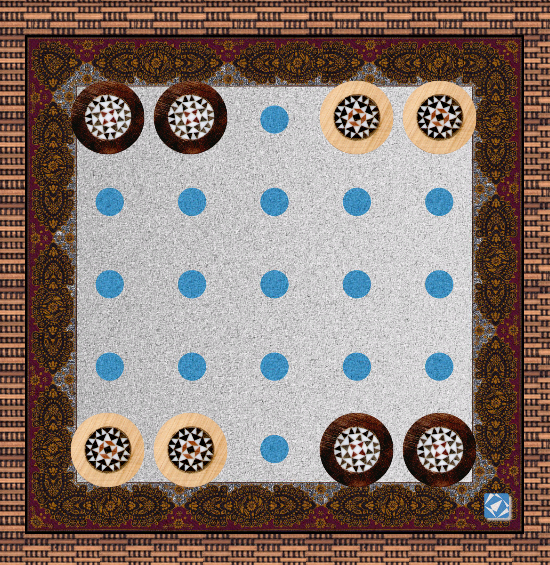 Players alternate turns on each move. 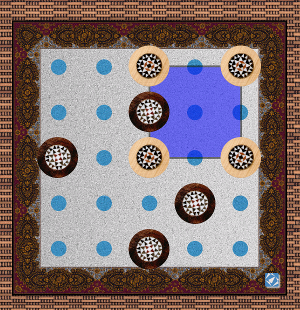 Each turn consists in moving an own pawn to an adjacent unoccupied field. 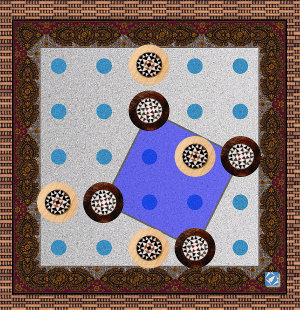 Objective is to form any sized exact square by own pawns. A square may be directed straight, diagonal, or oblique. Player wins immediately on reaching the objective. Available moves for light pawns. 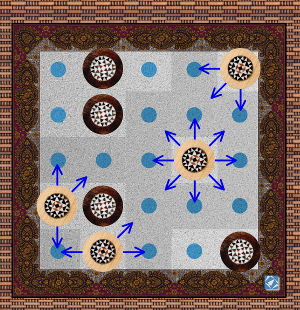 The diagram shows a sample situation of an ongoing game. 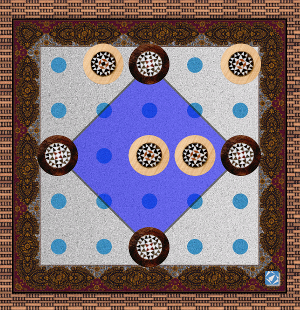 The arrows indicate all legal moves available for the player controlling the light pawns. Light straight small square wins. If edges of the winning square run exactly parallel towards the board edges the winning square is called a straight Mondrago. There are four different sizes of straight Mondrago winning squares. Here the light pawns form a winning three by three sized Mondrago. Dark diagonal huge square wins. Just two sizes of a Mondrago exist on diagonal justification. There are nine possible smaller diagonal Mondrago squares, too, and a huge one as shown here built by the dark pawns this time. Dark oblique small square wins. Oblique Mondrago squares exist in two sizes, too. Here dark built a small variant to win the game. Mind there are exactly 50 different constellations to win a 'Mondrago'. A player wins even if the opponent's pawns may be placed on edges or inner fields of any Mondrago. As an additional sign of mutual respect a handshake or high five is quite common as well. @author Oliver Merkel, Merkel(dot) Oliver(at) web(dot) de. Logos, brands, and trademarks belong to their respective owners. 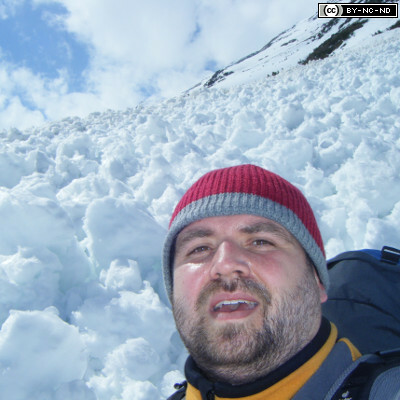 Images are licensed under a Creative Commons Attribution-NonCommercial-ShareAlike 4.0 International License. strictly belong to Adrian Schacker, adrian(dot)schacker(at)t-online(dot)de. These copyrights are not necessarily touched by the license above. This Mondrago implementation uses unmodified independent code libraries provided by third parties. Since their licenses might vary the corresponding information is externally linked below. Thus these external links will enable you to reproduce any copyright notice, any related list of conditions, disclaimers, and especially the copyright holders and authors of the corresponding third party functionality.